Welcome to Foundation Maps. Please enter your email address and password to login. * These totals may include re-granted funds. ** Organizations that receive and make grants are included in this list. Here are your indicators. Take them and begone! United States T. F. E. W.
How was this grant coded? *Government grants have been excluded. Constellations is an innovative new way to map your network to discover new points of connection. Enter a location or subject area in the top navigation to refine your search. Hover your cursor over a bubble to display the organization’s name. Click on a bubble to see an organization’s degree of centrality, a summary of its funding, and to pull up a grants list. Note: The names of the 10 most central organizations to the network will be automatically visible on screen. 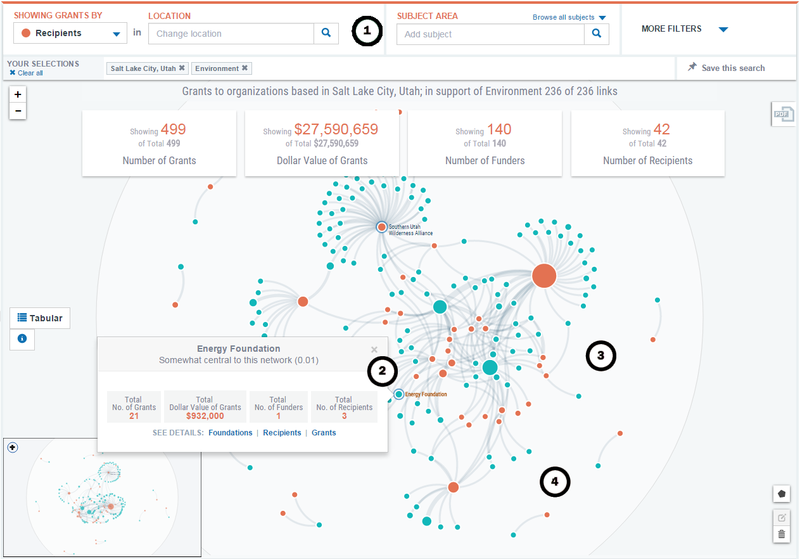 Click on a curved line to reveal a list of grants between the two connected organizations. Drag any of the bubbles to reposition them on your screen. Search an organization by name or click on Tabular for a sortable list of all the organizations in a given network. For your convenience, Constellations that have a very broad set of search criteria will display only the top 300 connections by total grant dollars. To narrow your search, consider using additional criteria found in the “More Filters” drop-down menu. We hope you've enjoyed trying out Foundation Maps! You have reached the limit of queries available to free trial users, and will be logged out shortly. If you believe you have received this message in error, please contact us at maps@foundationcenter.org.